Early man was well acquainted with the awesome power of lightning and knew that iron and certain other metals were attracted to magnetite, a kind of iron ore. The Ancient Greeks were familiar with the fact that rubbed amber attracted dust and chaff; indeed, their word for amber, "elektron," is the origin of the word electricity. Bend a piece of wire into a double right-angled shape with upturned ends as illustrated. Put one end on the rim of a glass and keep it in position with a metal plate or tray. The vertical arm inside should not touch the glass. Hang a strip of metal foil over the horizontal wire arm. Charge a comb or piece of paper with static by rubbing, then hold it near the tray rim. The foil ends will spring apart. 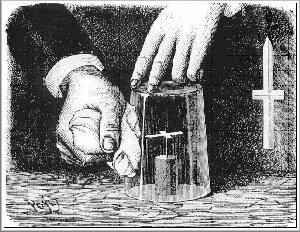 You have made an electroscope, a delicate instrument for detecting electric charges. 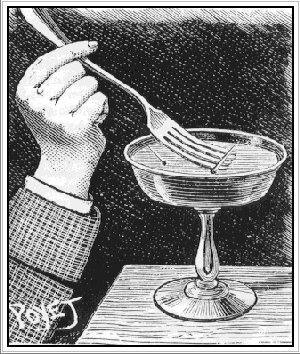 Touch the plate with your finger. This grounds the foil charge, giving it an opposite charge to the paper. The leaves collapse. Then take away your finger. The opposite charge in the paper will now flow to the foil. The leaves will spring apart again as they now have an opposite charge to the paper. All clear? Try it yourself. 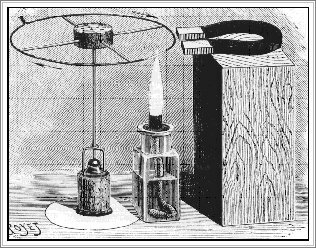 HANS OERSTED (1777-1851), a Danish scientist, discovered that an electric current produces a magnetic field at right angles to its flow. Now prove him right. Float a magnetised needle in a glass of water to make a compass . When those who aren't in the scientific "know" drop metal objects into water they sink like stones to the bottom. You are different, for when you drop, say, pins and needles into water they float. Miraculous? Not really. The secret is to keep the surface of the pin or needle that isn't touching the water quite dry. There are four ways of doing this, two rather difficult and two fairly easy. Lowering the needle by two looped threads is one way but you would have to remove the thread without disturbing either the water or the needle - no easy job. The second method, dropping it horizontally from just above the surface, is better, but you need a very steady hand because a crooked drop won't work. or float it on a piece of paper. The last is probably the most effective but you will leave a tell-tale piece of paper on the bottom because it is going to absorb the water and sink, leaving the needle afloat. Puzzle your friends by first giving them some pins and needles and inviting them to make these metal objects float. Unless they know the secret they will fail. The things will sink miserably and swiftly. Then you unveil your collection of floating pins and needles which you have previously prepared. "How's it done?" they ask. "Magic water," you say, putting them off the scent. Having mastered the art of making needles float, you can become a compass manufacturer. If you magnetise a needle - by stroking it one way only with a bar magnet - and float it in the way we have described, it will always point north and south. Of course, you know why. What you have made, in the simplest possible way, is a rudimentary compass. It won't be much use as a means of finding your way in the country, but it is a compass nevertheless. In both these demonstrations, the important point to remember is that the objects must be dry or they will sink. 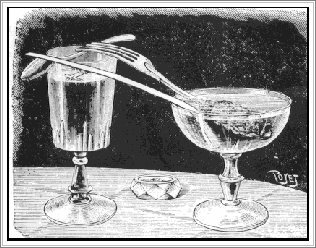 Place a teaspoon parallel to the needle across the rim of the glass. The battery to supply the current is made as follows. Wrap some small pieces of coke in a cloth and insert the handle of a fork. Immerse the bundle in a strong salt solution then rest the fork prongs on one end of the spoon. Balance a strip of zinc between the other end and the salt solution taking care not to touch the coke bundle. Chemical reaction in the solution produces a flow of electricity through the circuit of zinc, spoon, fork and salt solution. Notice how the needle is now deflected at right angles. 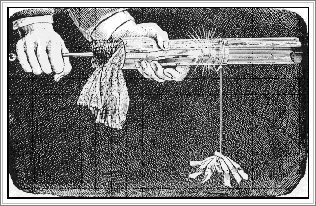 A fairly elaborate motor that is powerful enough to spin a wire wheel can be made from just a simple magnet and a spirit lamp. In this instance, building the wheel turns out to be far more complicated than assembling the motor itself. To make the wheel, use a thick slice of cork as the hub and insert four equal lengths of stiff copper wire as spokes. Make grooves in the end of each to take a rim of thin iron wire. Slot the rim into each spoke and twist both ends together so that it forms a circle. The axle for the wheel will be a steel knitting needle mounted on a base of cork that is glued to a thick cardboard circle. The entire axle rotates on a bearing made from a small, concave-centred button glued to the cork base. In the "cup" of this button place a glass bead with a hole bored through it. Now bend a hairpin or paper clip to form a small loop in the middle. Insert the two ends in the cork base so that it arches over the button. The axle is kept upright by the loop and the hole in the bead. Together they form a ball-and-socket arrangement. If necessary, oil this hinge from time to time. Electricity does not only flow out of wall sockets. It occurs everywhere in nature often appearing in the most unsuspected places. This is why it is possible to make a light without even using anything as elaborate as wires, light bulbs and fuses. You will need a glass cylinder, preferably one from an old oil lamp. Wrap a ring of tin foil around its middle. Attach another thin strip of foil from the end of the glass to roughly half an inch away from the foil ring. Next wrap a long soft brush in a silk handkerchief or silk cloth. Rub the inside of the glass briskly making sure not to touch the foil with your fingers. If you stand in a darkened corner you will soon see a large spark jump across the gap between the foil every time you pull the brush out of the cylinder. With this simple electricity generator you will be able to perform an endless variety of tricks and experiments. 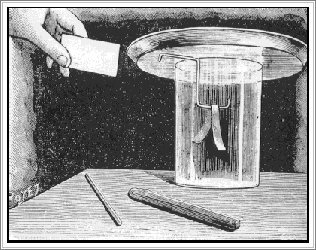 For example, if you the ring of tin foil and hang a few strips of thin paper at the end you will have built an electroscope quite similar to the one made earlier in the book. 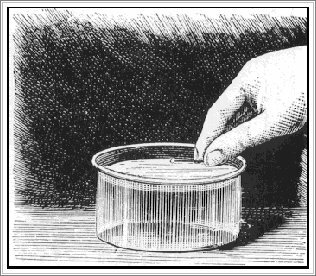 This time, rub the inside of the glass cylinder from the opposite direction you used before. The paper strips will soon bristle and lift up as the charge from the foil flows along the thread and into the paper. Since like charges repel each other, the bits of paper will be pushed apart. 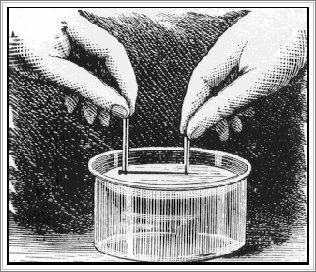 You have also demonstrated in this experiment that objects that are poor conductors, such as glass, readily take an electric charge when rubbed. Good conductors, on the other hand, readily transmit electricity between charged and neutral bodies. Fold a small piece of paper in such a way that it divides into quarters with creases to show where you have folded it. Using the intersection of these creases as the centre point, cut out a cross like the one illustrated. Trim the longer arms to make the point a little further from the centre intersection than the other squared end. Balance the paper cross on the point of a needle at the centre but take care not to pierce the paper. 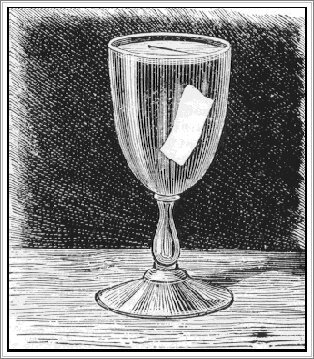 Insert the head of the needle in a cork and cover the whole structure with a glass tumbler. Tell your friends you can make the arrow inside the glass point at anyone you name without removing the glass. All you need to do is rub it with a silk handkerchief on the side facing the person you choose. The arrow will be attracted by the static on that side of the glass and will turn to point in his direction. Follow up this trick by making the arrow rotate at quite a speed by rubbing the tumbler top well, it isn't the top because the bottom is uppermost here - in a circular motion but always in the same direction. If you have the patience to do some rather fiddly paperwork you could make a paper cross with equal arms and from them suspend tiny cut-out horses by fine threads. This electric merry-go round will delight and amuse young children. Glass, porcelain, wood, textiles, waxes and resins are easily charged with static electricity but they are, like all such materials, bad conductors of an electric current. They are therefore obvious choices for use as insulators to separate conducting materials.